13 Going On 30 has tons of great nuggets for life (it's even a movie used in the Bible study, Chick Flicks, Dinner and A Movie...I highly recommend it for a fun girl's night), and writing...which of course is what I will focus on. For those of you who haven't seen this movie, a thirteen year old girl, Jenna, strives to fit into the popular “six chicks” against the advice of her slightly odd best friend, Matty. 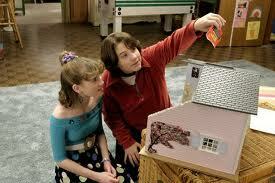 Matt is a sweet, non-conformist kind of guy, even building Jenna a customized dream house for her birthday. But Jenna is easily sidetracked from her sweet moments with this sensitive guy, and desperately tries to impress the popular crowd who have no interest in eager Jenna, and disappoint her again and again. Jenna finds herself longing to speed up time and become Thirty, Flirty, and Thriving... like the beautiful model in her fave magazine, Poise. Through the course of her transforming morning, she realizes she got everything she wanted...A high school career as a “Six chick”, homecoming queen on the arm of Chris Crandy, and working as an assistant editor at Poise. The rest of the story is Jenna “re-filling” the shoes of her egotistical, ruthless, deceitful future-self. This movie provides great examples of character growth, the suspense-building plot, and a significant black moment. The character overcomes challenges externally and internally giving the audience a reason to route for her. Jenna takes on her fast-pace adult life through the eyes of a thirteen year old. She falls for the sweet guy, her best friend Matt, not the most popular hockey player that she's supposedly dating. When she pitches her “redesign” for the magazine, it is a refreshing, soul-searching idea that her boss loves. She chisels away the shallow idea of what she wanted in her thirteen year old body, and makes choices that give her audience a reason to hope the best for her in the end. The guy she is in love with is engaged...will he break it off since he obviously has feelings for her? The boss loves her idea...will it help change her ruthless reputation and bring success to her magazine? Her best friend finds some incriminating evidence...will she ruin everything for Jenna? All these questions are answered exactly how we, the sympathetic audience, DO NOT want them to be answered. Everything in Jenna's life crumbles, and she finds herself completely hopeless and alone. We want her to have happiness now, we've seen her work for it, and re-shape her character for it. From a humorous, light-hearted, slightly unrealistic (okay, greatly unrealistic) comedy, we have a fun visual for the important anatomy of a well-written novel. Is there some character tweaking, or plot building that you can do to enhance the climax in your book? I loved the movie. I think the black moment is somethign we all experience in our books. Things just don't go the way we want them to. This counts for the writing and the characters. I love the post! 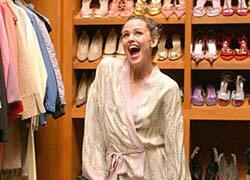 Angie, I loved this movie too--and was surprised at how many things went wrong for Jennifer Garner's character. I kept thinking, "No, no, no!" --and kept watching the movie, of course. I've had six weeks off from writing my WIP--it's summertime!--and I'm eager to get back to my characters. Now I'm thinking how can I make my readers think, "No, no, no!" --and keep reading? I've never seen the movie, but now I want to. And I want to tweak my plot a manuscript a bit. Great post! I love this movie! Jennifer Garner is perfect in this role. Great plot breakdown, too. There are things here to remember when plotting our novels! Beth- I have taken a small vacation from my characters and I'm ready to delve in again also! vvdenman, very cute movie...have fun tweaking! Laura, I am still learning so much about plotting, glad this has helped. Casey, makes me laugh out loud all the way through! Angie, so enjoyed your post. I haven't seen this movie yet, but I can see now I'm going to need to. :) Thanks for the great breakdown. I'm going to need to figure out more about my characters to draw the reader in and make my "black moment" more gripping. Thanks for the teaser about the movie! this is such a great post for a FUN movie. Characater growth is vital in any movie and book, don't you think? The BEST movies show us how the beginning character grows into a (usually) better character by the end. It's like they have to 'earn' the happy ending.